Lainie Ishbia, MSW is a mom, wife, licensed therapist, blogger, fashionista and disability and empowerment speaker. She wears leg braces and struggles with buttons and everyday fine motor tasks , due to a slowly progressive neuromuscular disorder called Charcot-Marie-Tooth Disorder. 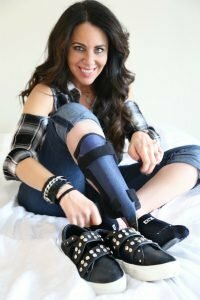 Lainie is passionate about helping women with invisible physical disabilities look & feel their best. She created a lifestyle and fashion blog called Trend-Able, to give her Perfectly Imperfect followers tools, ideas, and inspiration for living their best lives.